One interesting aspect of travelling in Spain is that each region of Spain has its own cultural quirks that make it very different than the next. One area that has some distinct differences is food. Today I’d like to highlight some of my favourites from the Catalonia region of Spain – that area includes places like Barcelona and Costa Brava. Eating in Spain is a lot cheaper than many of its European neighbours, so if you’re on a tight budget you can often splurge yet still have a few coins left in your pocket at the end of the day. This tomato bread is ubiquitous in Catalonia – its a wonder they don’t just hand it out on the streets. 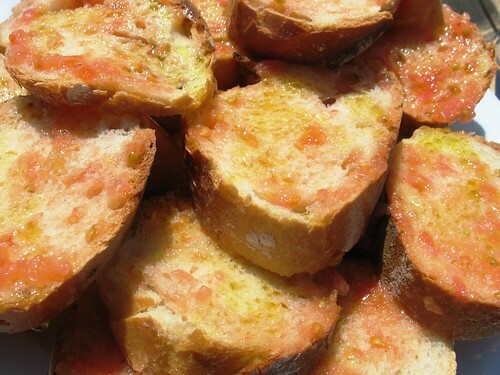 But there is nothing better than fresh baguette rubbed with tomato and drizzled with a touch of olive oil. You’ll probably find this at your hotel at breakfast (you might have to rub on the tomato yourself, which is a bit of an art), but it comes at the beginning of most lunch and dinner courses. It’s super yummy and I all but guarantee you’ll be making this when you get home – I am! If Catalonia has a comfort food, I’d think it would have to be suquet. 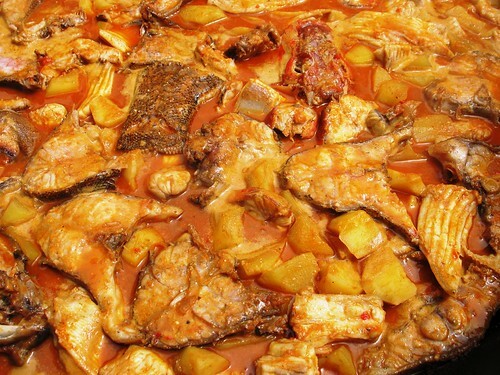 This is an old fisherman’s recipe, where piles of fish and tomatoes and olive oil are all thrown in and left to simmer. It’s halfway between a thick stew and a soup, though I suspect this is one of those dishes always prepared to the tastes of the chef. This is great for a chilly evening by the sea, or just to fill up after a heavy day of sightseeing, and because the fish is sourced locally, it isn’t always expensive. Crema Catalan is the region’s classic pudding/custard dish, and while it is simple, I do like seeing how each restaurant seems to spice it up a bit. 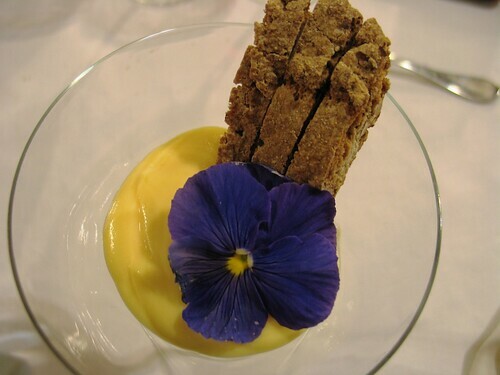 Above, as you can see, there is an edible flower as well as some biscotti to add a new flavour. I’ve also had it once with a bit of caramelised sugar on top, like creme brulee. Sometimes there is a dusting of cinnamon. It’s a bit of a staple dish like the tomato bread, and also a great way to end a meal.